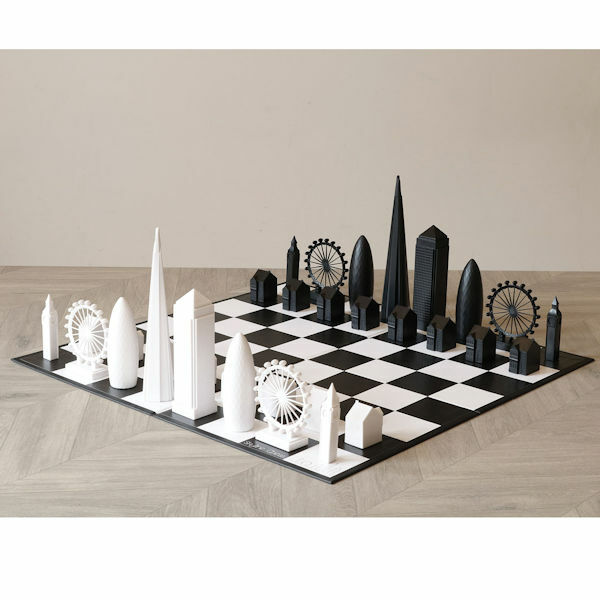 Play chess with some of the world's most iconic buildings. In this set (HY4856), Canary Wharf is the king, the Shard is the queen, 30 St. Mary Axe (the Gherkin) is the bishop, London Eye is the knight, and Big Ben is the rook. Pieces are cast acrylic, double-weighted with felt bases. Includes presentation box, 16" cardboard playing board and story card. King 4 ½" high. New York Skyline also available (HY4846 - sold separately).